Tim and I try to take turns writing these posts. That way, one of us usually has something ready to post before it's time to post it. It keeps us on task, planned out, and our ducks in a row. But I couldn't help but giggle to myself when I seen I was tasked with Camp Safety. See, I'm a pretty brave girl as long as bears, mayonnaise, heights, spiders or any combination of the four aren't anywhere near me. But I am also well-renowned as the world's most careless and accident prone person in the entire world. Well, maybe not the world, but absolutely the family. If anyone is gets hurt while camping, it will be me. Skinned knees, fire burns, pulled muscles, mysterious bug bites, and pitching a tent near a hornet's nest is only a small selection. I come home with bruises I didn't know I'd received. If there's one hole near the campsite, I will step in it. I've even had a hair product allergy causing an all-out body inflammatory and itching response (not good while camping!). I also usually win the honors of getting the first tick bite of the season -- but not this year! Tim's already had one. Can you believe it?! Tim mentioned a day or so before I was due to write this that he'd always heard, "Bravery and stupidity go hand in hand." My pride would prefer me to think it's not stupidity, but rather indiscretion - blunders - oversights that get me into these hot spots. But I suppose all those years of being clumsy brave has also taught me the ins-and-outs of camp safety. This is an easy one. Don't play in the fire. Don't burn down the forest. 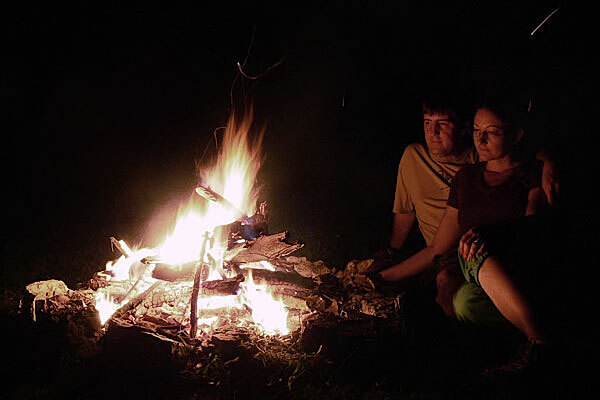 Put the fire out completely before leaving camp. The above can cause a lot of discomfort, and some bites or stings can be very dangerous. When you're camping, bugs are just inevitable. Use a good bug spray (we like Off! Deep Woods) to repel biting insects - especially ticks and mosquitoes. 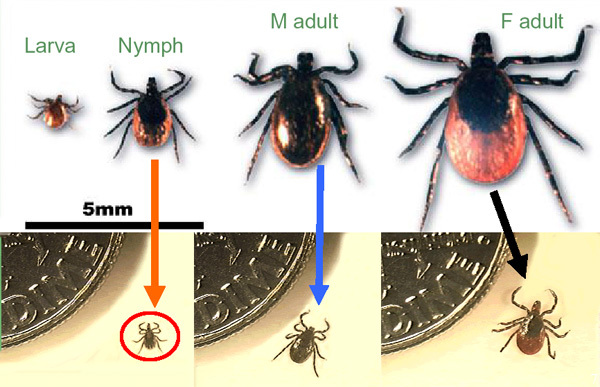 Learn how to properly remove a tick, how to identify Deer Ticks (below), and the symptoms of Lyme Disease. Know of any bee allergies, and keep an EpiPen handy if you are allergic. For those little menacing bites, keep hydrocortisone cream, StingEze, tweezers and alcohol swabs in your first aid kit. And don't forget to look UP when choosing a campsite - check for those hornet's nests! Anytime you're in the woods, you should keep a constant eye out for snakes. No snake bite is a good snake bite, but be especially concerned about venomous bites. 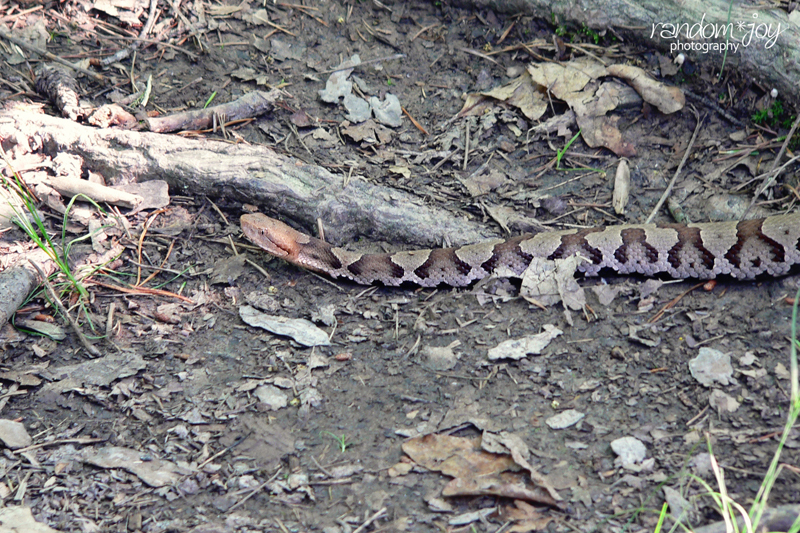 Here in East Tennessee, we have two venomous snakes: the Northern Copperhead (right) and the Eastern Timber Rattlesnake. The best advice is to never approach a snake. Even a non-venomous snake bite can cause problems - think bacteria (and lots of it!). If you see one on your camping trip, don't panic! After all, you are a guest in its home. Just give it lots of room, and soon it will move on about its business. Be especially careful when you're looking for deadwood or - for whatever reason - moving rocks. Camp cooking is not the same as cooking at home. Reaching proper internal temperatures is essentially important anytime you cook, but cooking outdoors can sometimes take considerably longer than cooking at home. The last thing you want is to interrupt your camping trip with a bad case of Salmonella poisoning. If you're overly concerned with this, a probe thermometer is an easy, small item to tote with you in your supplies box. Along the same lines is potable water. Most campgrounds are going to offer a central potable water spigot, and hookup campgrounds have individual campsite spigots. Make sure you are using the potable water for drinking. It will be adequately marked as such. 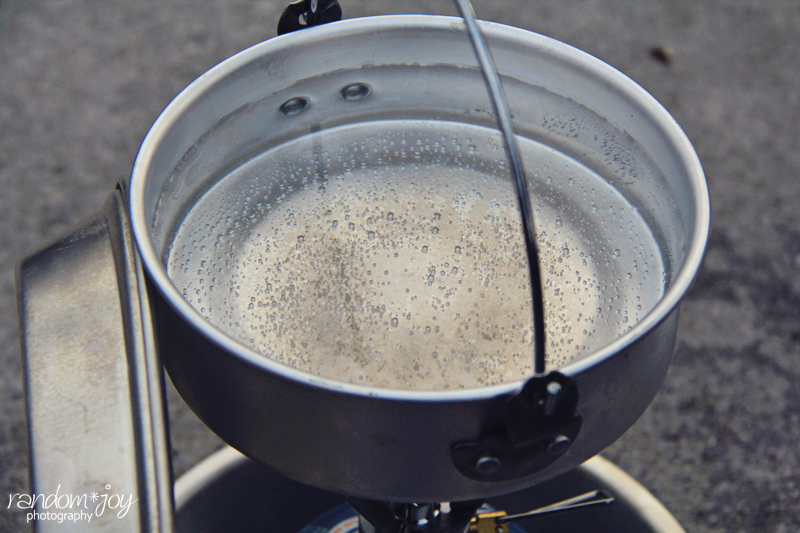 If you're in a campground that doesn't offer potable water like some of the more primitive type grounds, you'll want to make sure you've brought lots of water or you're using proper techniques to make existing water sources drinkable. There are plenty of ways to do this - another blog post in itself! - but boiling, filtration devices, and water tablets are all good choices. This may seem like a silly addition to the list, but personal health fits right into the safety category in my world. Our favorite camping spot has a really nice bathhouse. And nothing beats a good shower in the evening after you've been outside all day in the East Tennessee humidity. But keep in mind that it is a public bathing place. You really don't want to go home to discover a bad case of foot fungus. Showering with a pair of plastic flip-flops is always a good idea. Think back to those college days.